An interesting message has popped up in recent days on the US Government Diversity Visa Lottery (Green Card Lottery) Official Site. Lottery winners for DV-2013 were announced in May 2012 and as per usual you could log online to check if you were a winner this year. Winners will be notified by mail officially and then will have an interview at a US Consulate abroad or change status internally if already present in the US under another non-immigrant visa. However it seems like that not enough of this year’s winners have taken up their notification or possibly following an attendance of an interview and/or further background checks their application was deemed ineligible. I guess we shall see over the next few months whether a few more lucky people will join the approximately 55,000 people who win Green Cards via the Lottery each year. The irony of the whole situation is that a year ago we had almost the opposite situation where by the winners who were initially notified in May 2011 had to be rescinded due to a technology malfunction with the lottery itself. 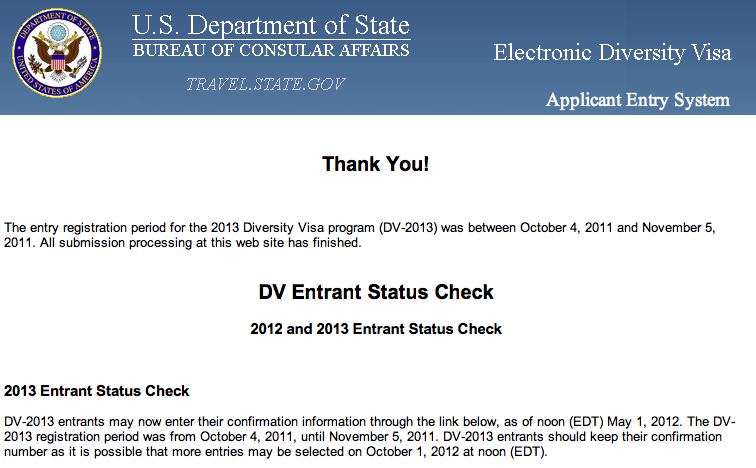 The DV-2012 Green Card Lottery was rerun and new winners were announced in July 2012. There was a subsequent lawsuit from some of the initial winners that was dismissed.